Posters may not be a thing of the past, but it seems that self-destructing photos and videos are the new trend in keeping students in the loop. 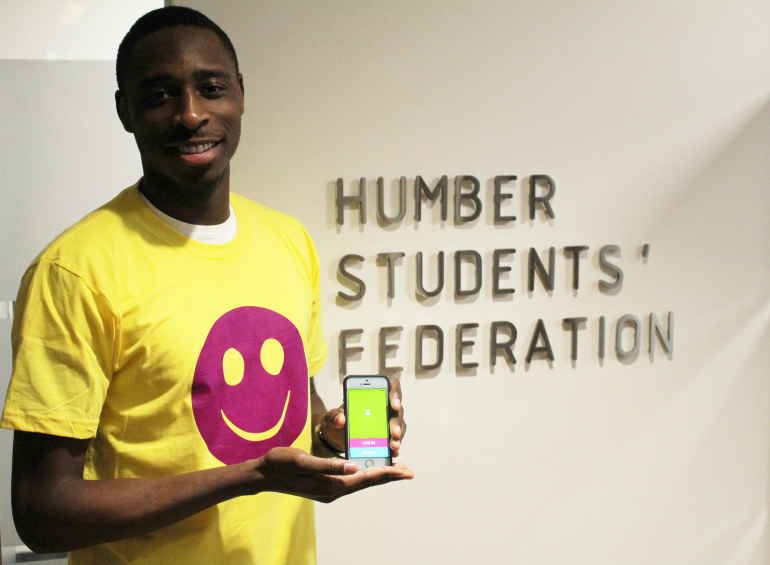 The Humber Students’ Federations at North and Lakeshore campuses is now using Snapchat to instantly reach students. Ahmed Tahir, HSF VP of Student Life at North campus said that he and Lakeshore VP of Student Life, Dylan Rudder, had wanted to create Snapchat accounts for their campuses since the summer. Tahir said that students are now using classic social media platforms such as Facebook, Twitter and Instagram less and that Snapchat has become the best way to keep students informed. Culinary Management student Taylor Sowerby agrees that Snapchat is a great way to stay in touch with what HSF is doing, including their sharing of quick videos of the giveaways they have on campus. “I saw that they were giving away shakers for the athletic students. That’s a great idea because those things are really expensive!” said Sowerby. He said that some of his friends who don’t go to Humber follow the Snapchat account to see what his life is like on campus. Crystal Holmes, a Media Foundations student, said she views the app as another good way to stay in touch with other students. Holmes said that when she’s at home she enjoys being able to see what is happening on campus via the updates. Osa Izirein, a second year Humber HVAC student, said that he doesn’t find the HSF Snapchats helpful so far. Izirein noted that one Snapchat he saw said Humber was handing out free waterbottles around the school, but it was uninformative. Media Studies student Lora-Lyn Slama agreed that HSF had some work to do. “I’ve noticed they snap right as an event is starting or just not at all. It would be better if they snapped more in advance,” Slama said. Izirein and Slama continue to follow the HSF updates on Snapchat and hope that their student feedback will improve the account’s interaction with students. Tahir heard the students’ concerns and said he and the rest of the HSF team value that kind of student feedback. “We want to get better at doing snaps and I think the more feedback we get and the more things we figure out with what students want to hear from our Snapchat account, the better,” Tahir said. Rudder said the HSF Lakeshore Snapchat account posts information before and during events. Rudder said that because of “liability”, Lakeshore’s HSF account does not add students on the account or receive messages from them. However, Rudder said that he shares his own personal Snapchat username and answers student questions on that account. Tahir said that North campus’ account replies to students’ questions sent in via Snapchat messages. Students who want another outlet to keep up with student life at Humber can add North campus’ or Lakeshore campus‘ HSF link at ‘hsfnorth’ or ‘hsflakeshore’, respectively. Written by: Ryan on February 6, 2015. This entry was posted in Humber College, Humber Et Cetera, Writing Portfolio and tagged article, humber college, humber et cetera, snapchat. Bookmark the permalink.